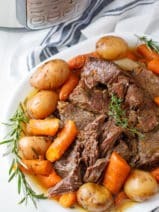 I’ve really enjoyed my partnership with , as a Crisco® Creator, and I have another wonderful Crisco® inspired recipe to share with you just in time for Valentine’s Day! I’m always thankful when Valentine’s Day rolls around in mid-February. It’s the perfect winter pit-stop holiday, and a great time to show the people in your life how much you care. 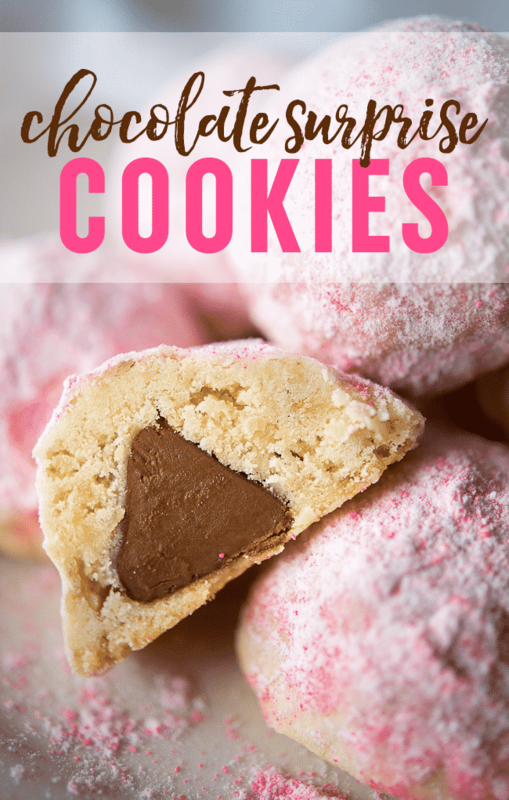 One way to create smiles this Valentine’s Day is with these adorable chocolate surprise cookies. 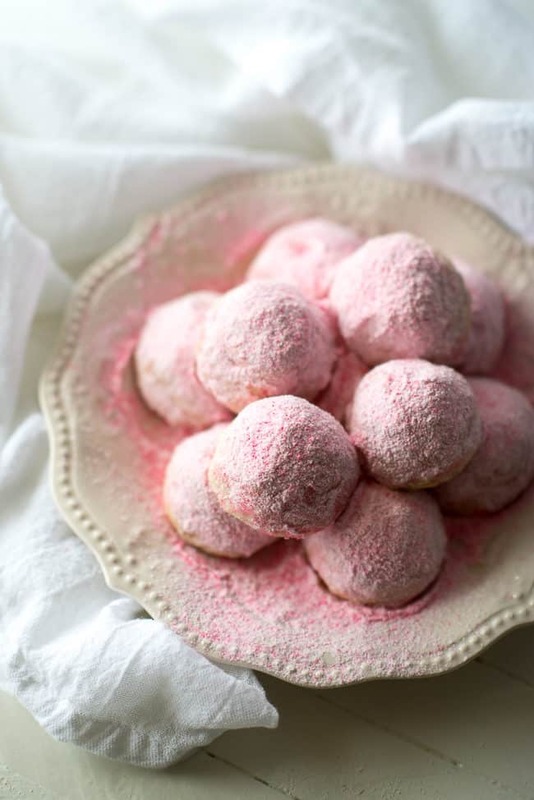 At first, they just look like pretty pink snowball cookies. 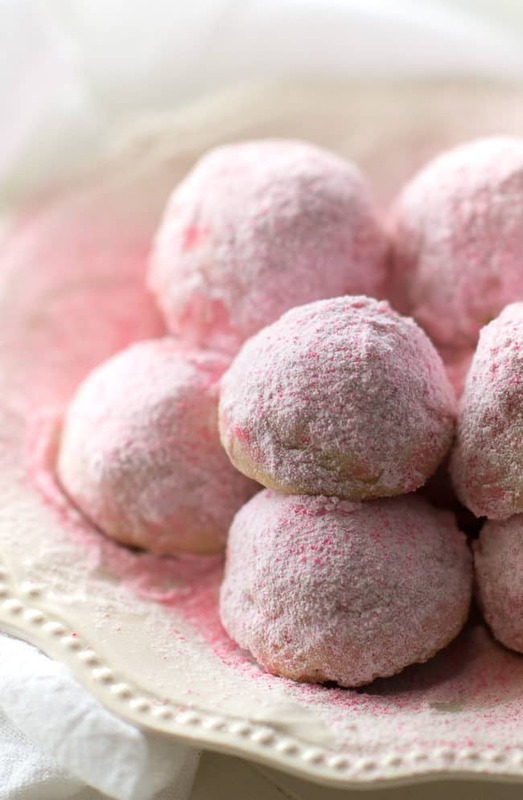 Pretty pink snowball cookies are pretty amazing on their own, but after one bite of these special treats a secret is revealed. A chocolate is nestled inside each one! Check out this video to find out how I make these special chocolate surprise cookies. I love baking with Crisco® Butter Flavor All-Vegetable Shortening Baking Sticks. You get the benefits of shortening, the convenience of baking sticks and that wonderful butter flavor in one handy little package. 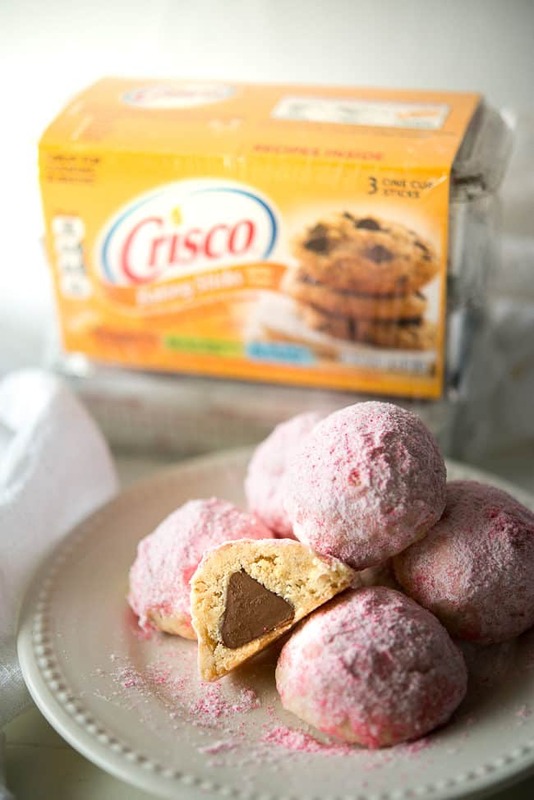 Crisco® shortening delivers higher, lighter-textured baked goods while also making them moist and tender. These cookies have that buttery, crispy and delicious flavor that may remind you of classic snowball cookies baked around the holidays. 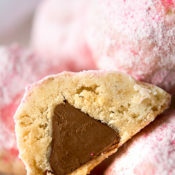 The chocolate inside and decorative pink powdered sugar make them unique and memorable. The first time I made these cookies I was skeptical about the chocolate maintaining its shape while baking, but, it’s quite a magical process and they come out perfect every time. Just be sure you place the chocolate surprise on the baking sheet with the bottom of the chocolate down and the point sticking up. My grandma always had a big blue container of Crisco® shortening on her counter. She used it for so many delicious dishes that I can remember. My grandma knew that it makes your pie crust flaky and your cookies soft. 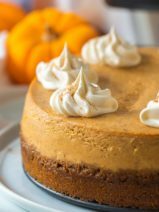 I’m so glad to have had the opportunity to explore some wonderful recipes using this family-favorite ingredient over the past year! I hope you have a perfectly sweet Valentine’s Day, and that you enjoy these delicious chocolate surprise cookies! 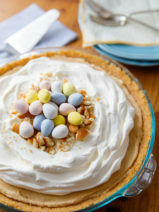 Visit to find sweet and savory recipe ideas to help inspire you in the kitchen! You can also search #CriscoCreators on social media to see what my fellow Crisco Creators have been cooking and baking in their kitchens. Preheat oven to 325 degrees F. Line a cookie sheet with parchment paper. In a medium bowl using an electric mixer beat the shortening until smooth. Add the ¾ cup powdered sugar and beat until combined. Add the milk and vanilla and beat on medium speed until creamy. In a separate bowl, combine the flour, oats and the salt. Gradually add to the shortening mixture. Shape into rounded tablespoons inserting the chocolate into the middle. 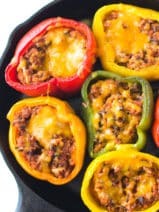 Bake for 15 to 18 minutes. 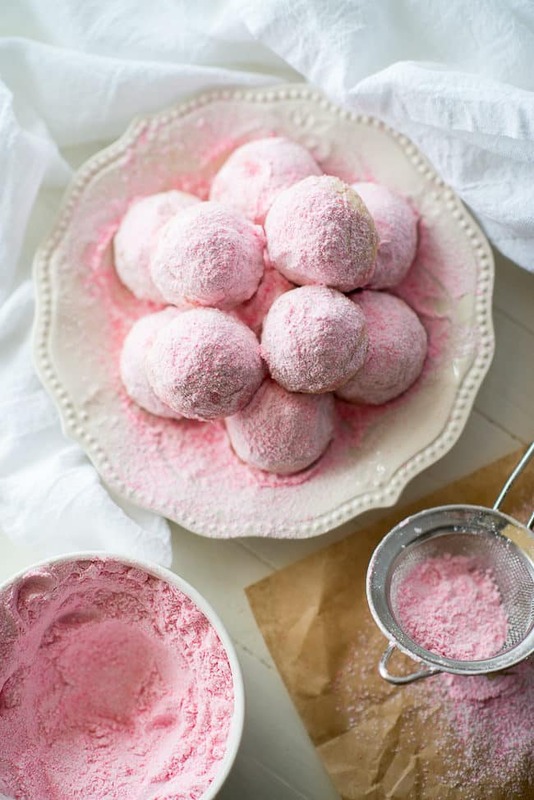 Roll immediately in the pink powdered sugar. Sprinkle again a second time if desired. Add 1 cup powdered sugar to food processor. Slowly add pink gel food coloring, processing as you go. It will take about half a tube of gel food coloring to begin to see results. Add until desired color is achieved. Pour sugar out on baking sheet and work out the lumps. This will need to dry several hours to overnight. When I made mine, I put the baking sheet in my oven overnight for drying. Otherwise, you can leave it out on your counter with paper towels across the top so it still has access to air.